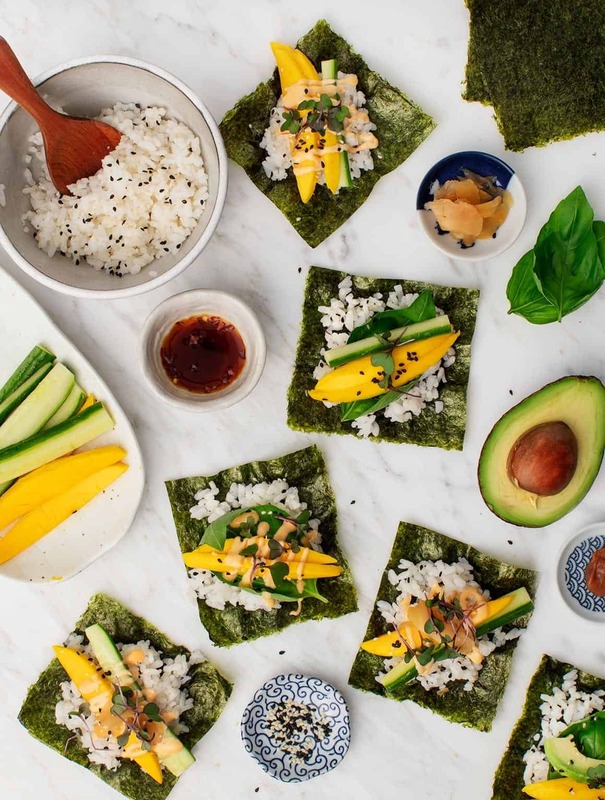 If you love sushi but don't love rolling it at home, these easy nori wraps are for you. They taste just as good, especially with spicy mayo drizzled on top! Meal #2 this week: Nori wraps! 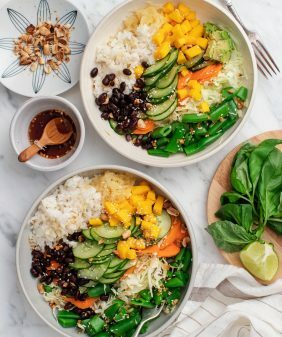 If you missed Monday’s post, I made these Mango Black Bean Ginger Rice Bowls as part of this week’s three meal series showing how ingredients from one meal can work into the next, and then again into one more. I did a similar five part plan a few months ago, and many of you wrote to tell me how helpful it was… so here we are again! At the end of the week, I’ll recap it all with a full grocery list. I basically wrapped all of that up into nori squares and made some spicy mayo to go along with it. 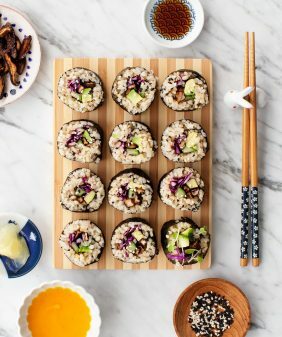 If you’ve never tried nori – now’s your chance! Sea vegetables are so good for you 🙂 and the crispy nori is so delicious wrapped around soft rice and juicy mango. 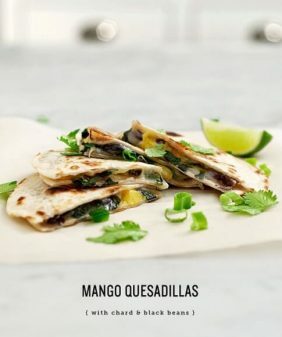 If you’re still not convinced, these would also be yummy as lettuce wraps or collard wraps (if you use collards, blanch them briefly to soften the coarse greens). There are some *very* optional ingredients here: strips of baked tofu (for protein) and a dab of umeboshi paste (salty pickled plum) that I always have on hand to enjoy with my rice. 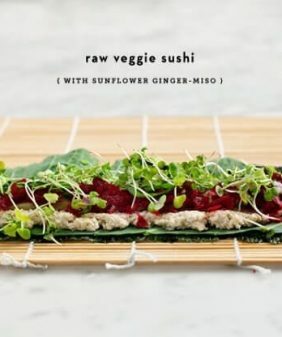 This is a fun sushi-like dinner when you don’t feel like making actual sushi rolls (if you do want to make sushi rolls, check out this post). 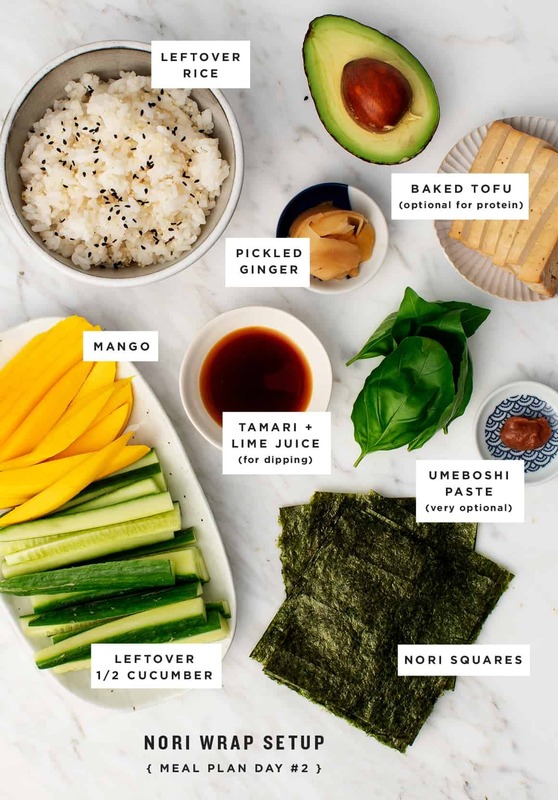 For these wraps, just prep all of the ingredients and assemble each wrap as you’re ready to eat it so that the nori stays crisp. These wraps are a nice light summer dinner (or a tasty lunch). Depending on your appetite, you could certainly make more rice and/or add additional toppings into the mix if you like. Stay tuned for the final recipe in the series on Friday! 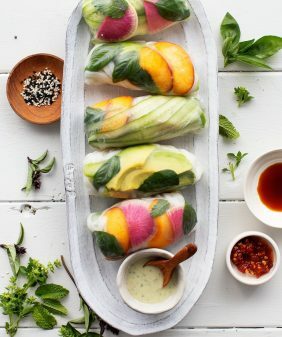 Make these easy nori wraps for a light lunch or dinner! They're just as good as sushi, but they take half the effort. Gluten-free, vegan option. Mix the cooked rice with a small splash of rice vinegar and a pinch of cane sugar. Tip: if you're using leftover rice, revive it by folding in a drizzle of warm water to help make it sticky again. In a very small bowl, combine the tamari and the lime juice and set aside to use as a dipping sauce. 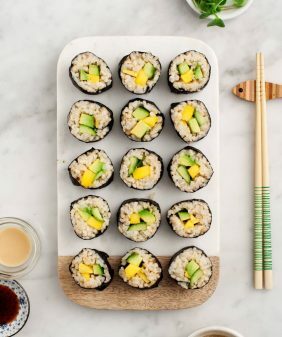 Serve the nori squares, rice, cucumber, mango, avocado, pickled ginger, sesame seeds, and desired extras, on a platter to assemble as you eat, mixing and matching fillings as you like. Serve with the tamari-lime dipping sauce and spicy mayo. *If you’re making tomorrow’s recipe, make extra spicy mayo. I highly recommend using Sir Kensington’s Avocado Oil Mayo in this recipe - it gives this 2-ingredient sauce such a wonderful flavor. Make this vegan by using vegan mayo. I usually get nori in the <g class="gr_ gr_87 gr-alert gr_spell gr_inline_cards gr_run_anim ContextualSpelling ins-del multiReplace" id="87" data-gr-id="87">asian</g> aisle at Whole Foods, or at any <g class="gr_ gr_89 gr-alert gr_spell gr_inline_cards gr_run_anim ContextualSpelling ins-del multiReplace" id="89" data-gr-id="89">asian</g> grocery store. You can also get it on Amazon, I've used Eden Organics and Emerald Cove brands (among others). Such a fresh and fun idea! Hi Sara, I’m sorry I don’t count calories… doing so has led to unhealthy eating habits for me in the past.